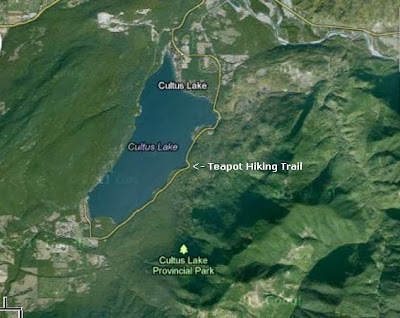 "My wife and I were chased out of the woods by what I am sure was a Bigfoot in the Lake George/Buck Mountain region of the Adirondacks, New York in Warren County." A couple were chased away from their resting place by what seemed to be a Bigfoot. Around July 9th, 2000 — My wife and I were chased out of the woods by what I am sure was a Bigfoot in the Lake George/Buck Mountain region of the Adirondacks, New York in Warren County. The creature observed us from about 100 feet away and broke large branches and made a large roaring/screaming like sound at least 7 times, maybe more that could only come from a very large mammal. I have been in the woods with very large bears and have even taken away food bags from bears, but this was no bear or Coy-dog, it was much larger. We never did see it, but we could hear it following us out through the trail in the woods and I have NEVER been so scared in all my life. It kept coming closer — would stop and "roar", then approach us closer. We were nearly frozen in fear, but managed to collect our things from where we had been resting and nearly ran out of the woods. My wife is a very big skeptic of Bigfoot... until this point. 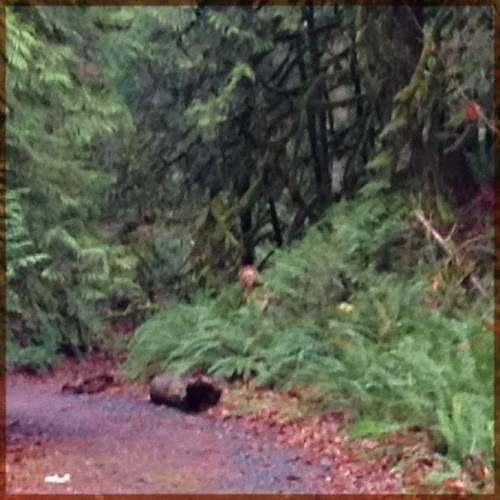 The whole time we walked out of the woods, she kept on commenting that it was following us. We could feel it watching us and could hear it through the woods, a few times I saw something moving through the woods parallel with us but tried not to look as we both picked up large sticks in case in attacked us. There was no one parked at the trail head when we came out and I suspect it had followed out 2 other hikers that had hiked in earlier ahead of us and just happened to come across us. The sounds we heard that day have really bothered me since then. I am literally scared to death of going into the woods alone now, even though I have been hiking for over 20 years. I can't explain the terror I felt from hearing this thing. I feel like I have to go back to the area and check it out, but my wife will never go back into the woods after this incident, that's how frightening these sounds were. I was wondering if you know of anyone in the Upstate NY area that researches Bigfoot that would go up into the trail with me to just look around and see if we can maybe find tracks of some sort or look for signs of the creature. Thanks JW, witness identity withheld by request. Recorded on July 8th, 2012 and then uploaded to YouTube on August 13th, 2012, according to the user, this is the longest recorded bigfoot vocalization. Watch the video and read the description below. 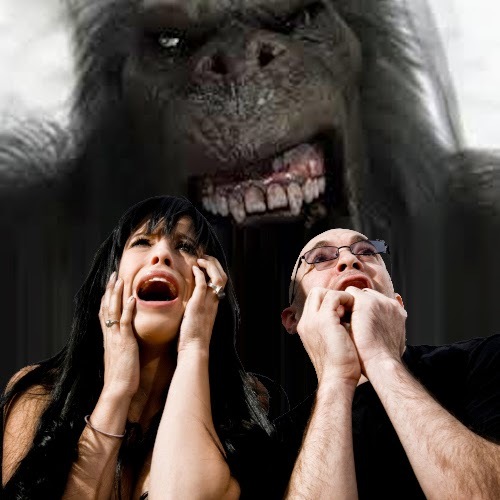 Bigfoot screams captured on audio july 8th, 2012 in the sierras near clippermills,ca. This is as it happend and 100% real.The experince lasted 20 mins and It has been edited to 15 mins to youtubes requirements. Hawley, Texas --Two boys clearing brush in the morning at Bob Scott's ranch were resting around 10 a.m., when they notice breaking of tree limbs and shower of rocks, one of which hit Larry Suggs age 15 on the right calf. Courtesy John Green's BC Archives. We are big fans of the TV series Twin Peaks. 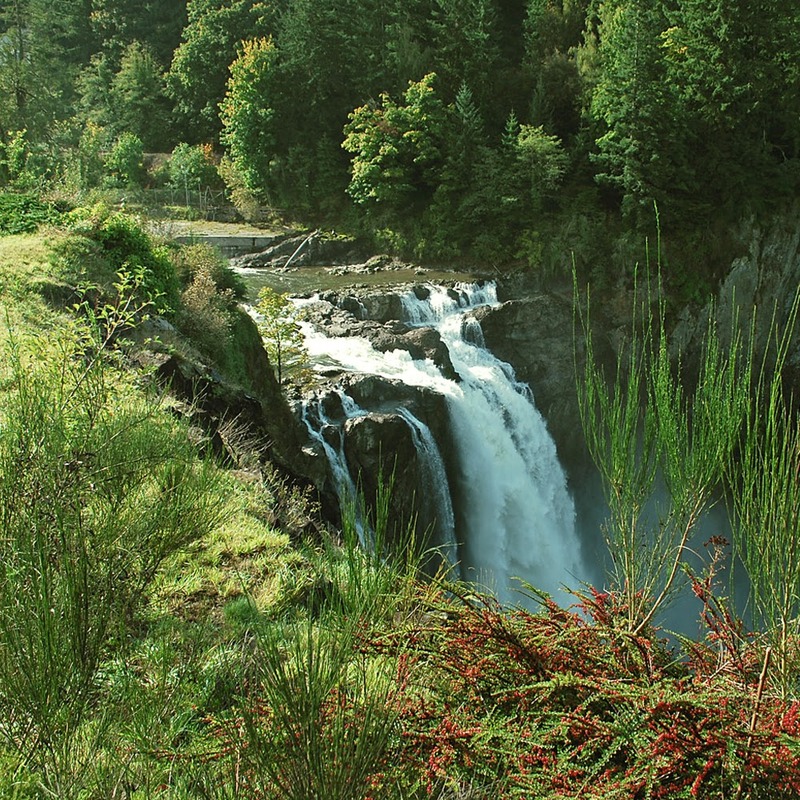 So to find out that there was any activity in the Snoqualmie/North Bend area, where Twin Peaks was filmed, perked our interest. And just like Twin Peaks this mystery was not what it seems from the outset. 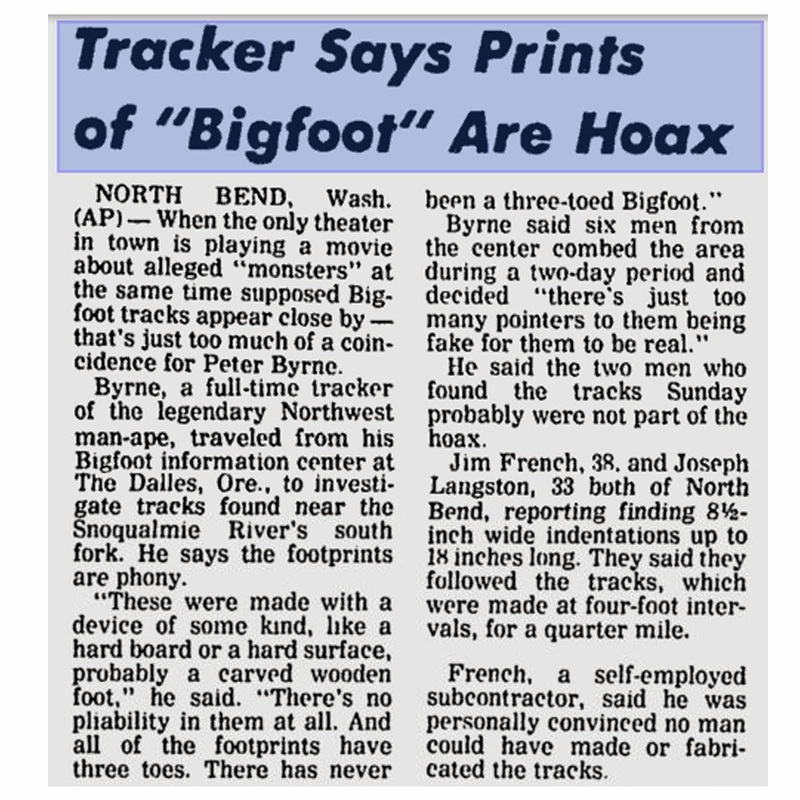 Read the original reporting by the Lewiston Tribune below where a man claims to have cast five Bigfoot prints. Jim French says he was skeptical of reports about Bigfoot, the Northwest's legendary ape-man, until he and a companion discovered 18-inch long footprints Sunday in a river sandbank. "I always believed it was a bunch of bunk," French, 38, said Monday after he and Joseph Langston, 33, found the four-toed, 8 1/2-inch wide indentions near the south fork of the Snoqualmie River. French estimated the creature weighed about 400 pounds because of the depth of its prints in the sand when compared with his own. French said he weighs about 180. The animal's size has not been verified by the scientific community, however. French said he made five plaster casts of the footprints and he and Langston found hair on some tree limbs along the creature's path. The hair was found about five or six feet off the ground, he said. French said he intended to contact University of Washington scientists and let them analyze his findings. His first reaction Sunday, French said, was that the prints were a hoax. "I could not believe what I saw," said the veteran outdoorsman. "There was no evidence of any four-footed marks anywhere." French and Langston consulted three other outdoorsmen. They concluded the prints were authentic. "No man helped me make those tracks," he said. "Whatever made them, made them by themselves." French first noted the tracks in hard sand. He could see only the toe marks and thought they were from a club-footed elk. They tracked the creature for a quarter of a mile before losing it amongst loam and leaves and then pasture land where prints of horses and dogs could be seen. The creature was moving east to west French said, adding that all the tracks matched the terrain. Slide marks appeared when the animal was going downhill and deep indentations were found when it dug in going up a slope, French said. The stride lengthened when it loped across flat ground. French, a self-employed subcontractor, and Langston, a lumbermill employe [sic], were using a metal detector to search for items of value along the river when they found the prints. Not everybody was convinced of the evidence. Peter Byrne thought that a movie about Bigfoot playing in the same area was to coincidental. Check out the clip below. January 26, 1869 -- Gallipolis, Ohio is excited over a wild man who is reported to haunt the woods near that city. He goes naked, is covered with hair. is gigantic in height and "his eyes start from the sockets." He attacked a Carriage containing a man and daughter a few days ago. He is said to have bounded at the father, catching him in a grip like that of a vice and hurling him upon the earth; falling upon him and endeavoring to bite and scratch him like a wild animal. The struggle was long and fearful, rolling and wallowing in the deep mud, half suffocated, sometime beneath his adversary, whose burning and maniac eyes glared into his own with murderous and savage intensity. Just as he was about to become exhausted from exertions, the daughter, taking courage at the imminent danger of her parent, snatched up a rock and hurling it at the head of her father's would-be-murderer, was fortunate enough to put an end to the struggle by striking him somewhere about the ear. The creature was not stunned, but feeling unequal to further exertions, slowly got up and retired into a neighboring copse that skirted the road. 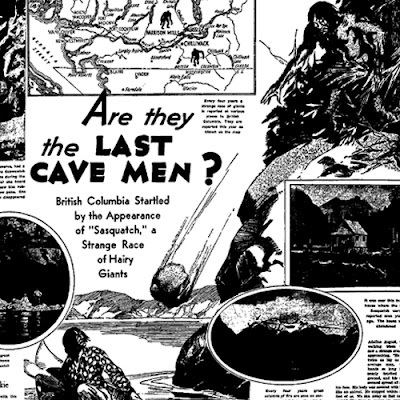 Credit for finding this article goes to the late Scott McClean who relentlessly scoured newspaper archives to find articles that predate the term Bigfoot or Sasquatch. This search paved the way to find earlier articles of Bigfoot we would have never been exposed to. I never met him, but the community who did, remember him with great fondness. You can read an endearing eulogy for Scott McClean by the talented Tom Yamarone. Cliff Barackman also has a great post honoring Scott McClean's memory at his blog. Here's a quick social studies course on Malaysia. Malaysia has 13 states, and each state is has a chief executive, but some leaders are hereditary (monarchy) rulers with the title Menteri Besar, while others are appointed by the political party, these are known as Ketua Menteri. The reason why I mention this is in the article the person who is quoted the most is Menteri Besar Datuk Abdul Ghani Othman. Menteri Besar is his title, and Abdul Ghani Othman is his most honorable name. JOHOR BAHARU, Jan 25 (Bernama) -- The state government will set up two expedition teams to track "bigfoot", the hairy creature allegedly seen in the forests of Johor. Menteri Besar Datuk Abdul Ghani Othman said the teams would be led by experts who would conduct a study on various aspects of the creature as well as to explore the state forest. He said the expedition to track the creature would be carried out in stages with the cooperation of the Johor National Park Corporation (JNPC). "One team will explore the forest areas while the other to study the existence of the creature," he told reporters after chairing the weekly state exco meeting at the Sultan Ibrahim building, here Wednesday. Abdul Ghani said the vast forest area of the state, including the Endau-Rompin National Park and at Kota Tinggi, should be explored to obtain scientific evidence on the existence of the creature. "We have obtained description of the creature from those who claimed to have seen it ... we hope the expedition will be able to prove its existence," he added. There have been claims of the creature been seen in the forests of Tanjung Piai, Mersing, Kahang, Endau-Rompin National Park and Kota Tinggi. Three workers at a fish pond in Kampung Mawai, Kota Tinggi claimed to have seen a "bigfoot" family last November. Every year we will revisit this article and try and get some updates for you. India has many strange tales of the Mande Burung, including one where a villager was force to breast-feed on a Mande Burung. The story below is a little less, well, exotic and seems to mirror our own efforts in North America. Even to the point of authorities showing little interest. Shillong, July 3, 2008: “Gigantic, hairy, ape-like...” was all that Abu Marak could utter in between gasps for breath. Surrounded by villagers in the safety of his house near Durabanda in the West Garo Hills, Abu’s eyes still mirrored the excitement of spotting the animal. 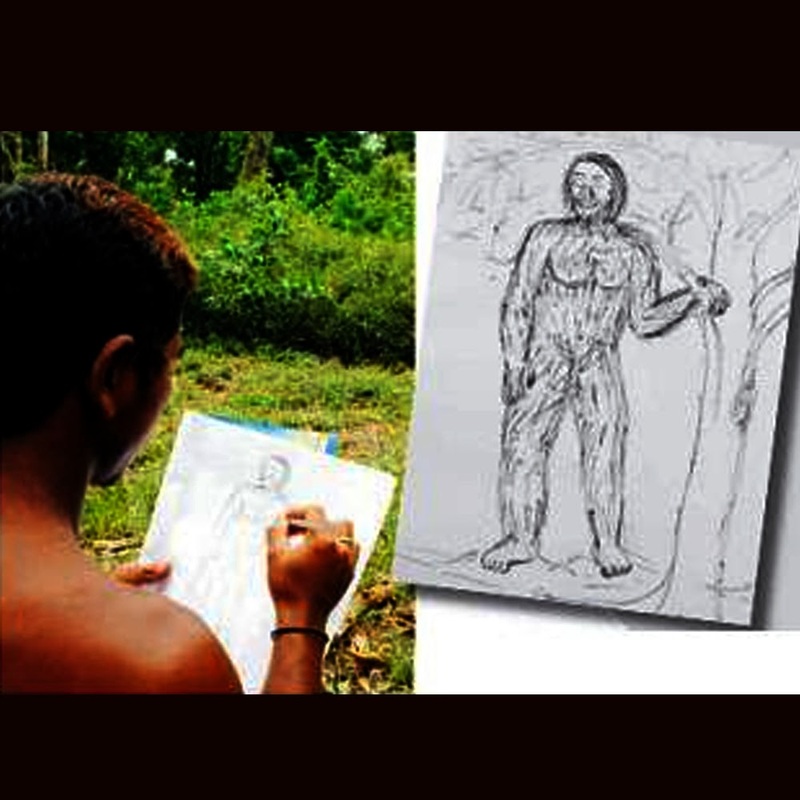 Within a few days, Abu’s account, coupled with those of a few other villagers, became the raw material for a renewed scientific search for the legendary Big Foot — mande burung in Garo. Sasquatch in North America, yowie in Australia, yeti in Nepal — Big Foot has its share of dedicated followers across the globe. The creature, which is supposed to be about eight feet tall, is said to have been last sighted at Rongrigittim in South Garo Hills in July 2005, before making a reappearance in May this year. The Achik Tourism Society, which has been on this elusive animal’s trail for the past few years, said the best sighting data was recorded in between January and March in 2002. This year, the animal was spotted in forests between Nokrek and Chokpot. “Soon after receiving news from the villagers, we sent our team on the trail of this unknown creature, but unfortunately we could neither see it, nor record any footprints,” said Dipu N. Marak, general secretary of the Achik Tourism Society. By the time the villagers reported their findings, the mande burung had shifted its location, rued Dipu. Before coming together as the Achik Tourism Society, Marak and his friends were engaged in compiling data about Big Foot. “We started our data collection on November 15, 1997, when the creature was first seen near Andol Chiring, in South Garo Hills,” Dipu said. Information on the mande burung are available in the form of video footages and photographs of footprints, which measure between 14 to 15 inches and impressions believed to have been left by the creature on trees and nests. “We have already alerted the Wild Life Trust of India after hearing about its sighting this year, but the authorities have shown little interest in the creature,” Dipu said. The Achik Tourism Society has also apprised the deputy director of tourism in Tura about the findings. Conservationists and biologists believe that the creature, which could be a descendant of the ancient primate, may have been living in the dense jungles of the Nokrek peak. “I have seen the footprints of this creature. It’s really big and I am convinced that such a creature has a home in Nokrek,” he said. Llewellyn came down heavily on forest guards and officials for not heeding the villagers’ reports. All attempts by conservationists to persuade the forest department to initiate a research into the mande burung have also proved futile. But that has not dampened the spirit of those who have ceaselessly been collecting every detail to prove that Big elusive Foot does existence. 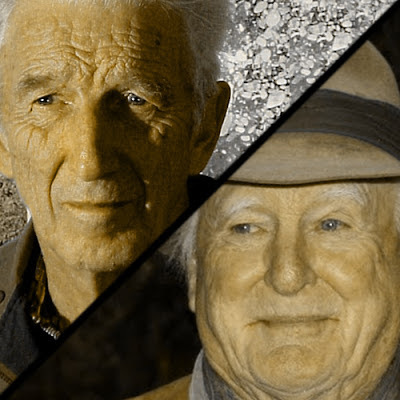 John Green (left) Peter Byrne (right) are pioneers of Bigfoot research. In an article almost two decades old we see some of the same divisive debates that still plague the modern Bigfoot community. Ape vs. human. Kill vs. No-kill. The excerpt further below is from the July 2, 1995 Chicago Tribune article. In the article you will read opinions of Peter Byrne from Grover Krantz and John Green. At the time Mr. Byrne was investigating the Bigfoot mystery under a grant from the Academy of Applied Science. A former Big Game Hunter, he was initially involved in the search for the Himalyan Yeti in the 1950's in the Slick expedition. Grover Krantz was a professor of physical anthropology at Washington State University, perhaps most famous to the general public as one of the few scientists not only to research Bigfoot, but also to express his belief in the cryptid's existence. Finally John Green is Canadian retired journalist and first began investigating Sasquatch sightings and track finds in 1957 after meeting René Dahinden. But then, in 1992, good luck struck. Byrne received from Boston's Academy of Applied Science a very generous five-year grant. It provided enough money to found the Bigfoot Research Project, and to hire two assistants to help him launch the most high-tech monster search the world has ever seen--a search that relies on police gear, wildlife research equipment, a Jeep, a video camera, and, above all, a phone line. Byrne has a toll-free number, 1-800-BIGFOOT, and a dozen or so people call in every month to report sightings. The old hunter takes notes and then, if a sighting sounds promising, he rushes off to investigate- -to peruse the crushed twigs or watch witnesses imitate the horrible scream. Every detail is logged onto computers. Eventually, if all goes as planned, Sasquatch's migrational patterns will become clear, and Byrne can jump into a helicopter. There are, on standby, two Bell 206 choppers equipped with the infared sensors used to track prison escapees. These would zero in on the beast, and Byrne would shoot a small dart. The dart would loop into the Sasquatch's flesh, extracting a small bit of tissue--enough to fill up, say, one tiny test tube--and ultimately the creature would lope off, unharmed. And the cameras would whir: You know the tabloids would be there. Indeed, they can't wait. Last year, the crew of "Unsolved Mysteries," an independent syndicated TV show, spent a week with Byrne filming a mock Bigfoot hunt that was replete with a Hollywood stunt man wearing oversized shoes. Byrne has also been covered by "Ancient Mysteries," "Sightings," and the Australian Broadcast Corporation, and newspapers ranging from The Hood River News to The New York Times. There critics are out there. With all the fame has come criticism. For instance, Grover Krantz, a Bigfoot believer who teaches anthropology at Washington State University, argues that Byrne is "a sham, a fake." Krantz takes issue mainly with Byrne's opposition to killing, which evolved after decades of watching bumbling tourists murder Nepalese tigers. "I argue for humane treatment too," says Krantz. 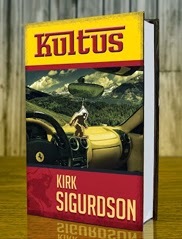 "But in order to attain protection for the Sasquatch, we have to prove they exist. And Peter knows that the only way we can do that is by bringing in a body." John Green, a retired Canadian journalist who has written several books on Bigfoot, is even more critical. "Peter Byrne is a fraud," Green says. "He tells the public that Sasquatch is near human because that's what they like to hear." Green is certain that, "if Sasquatch is real, he's just an animal." But Byrne feels the truth is far more complex: He likes to think of the creature as a convict. "As a child," he explains, "we played a game called Convict 99. One person was the fugitive. Others were the police; they tried to put themselves in the mind of a fugitive. Now we're trying to do the same thing. Bigfoot is out there, but where? Where is he hiding?" It's a vast question and, trying to answer it, Byrne has forded an icy, chest-deep stream on snowshoes and slept out on winter nights with nothing but a small fire to warm him. He says, "It's like we're trying to find a needle in a haystack and the needle is moving and it doesn't want to be found." 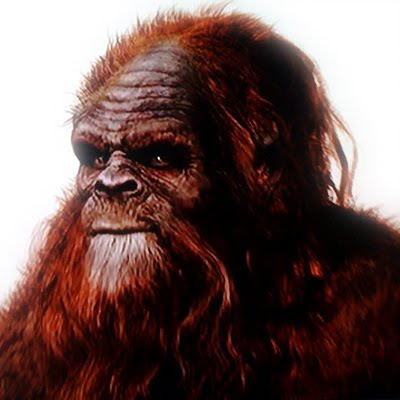 Bob Heironimus, a 64-year-old retired man from Yakima, Washington, claims the famous 1967 Roger Patterson film of the legendary "Bigfoot" was all a hoax, on PAX TV's "Lie Detector," airing Tuesday, May 17, 8:00-9:00 p.m. ET/PT. 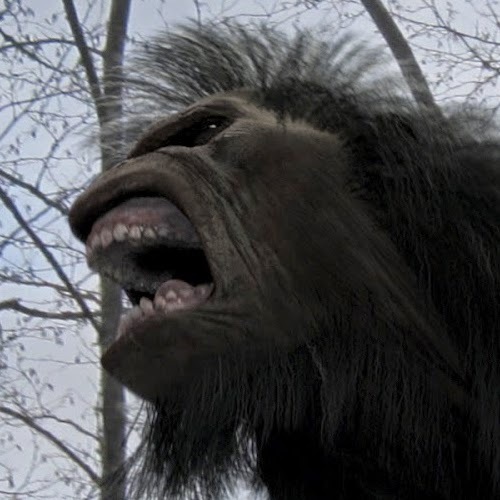 Heironimus submitted to a lie detector test administered by leading polygraph expert Dr. Ed Gelb to try to prove that he was the infamous creature shot on film in Bluff Creek, California, wearing just a modified gorilla costume, which does not match the figure in the Patterson film. Not even close. Hosted by Rolonda Watts, "Lie Detector" is a provocative series that examines the truth behind real-life stories ripped from the headlines, using the most powerful instrument to detect deception - the polygraph. Heironimus took the polygraph on live television and passed the test according to Dr. Ed Gelb, proving once and for all that along with passed polygraphs by serial killers like Ted Bundy, Heironimus believes he was the man in the suit to the degree that he too was able to pass the polygraph. Is it any wonder the polygraph is not admissible evidence in a court of law? It is note worthy to mention that Heironimus is unable to produce the alleged costume with breasts he allegedly wore 38 years ago and he was unable to satisfactorly say why he waited all these years to make such an admission. Additionally, Heironimus footprints do not match those left by the creature in the Patterson Film and he is unable to duplicate the locomotion of the creature filmed by Roger Patteron in October of 1967. The fundamental nature of Heironimus' statement is phoney. He lied and passed the polygraph anyway, just as serial killer Ted Bundy did all the way down death row to the electric chair. After watching the video below you can read about Bill Munns project to definitively put the debate to bed. These pictures are from Bill's Discovery Day V presentation, as he discussed in great detail his recent work, made possible by a Grant arranged by Dr. Meldrum, in recreating the anatomy of "Patty" using live models for in depth comparisons between her movement and various natural versions of the human form, both male and female, in costume and sans clothing. He also made several chest panels using various synthetic materials available in 1967, in order to try and recreate a costume which would duplicate the appearance of Patty and her movement. The third branch of this project was the recreation of the "costume" described by Bob Heironimus in his claim that he was hired by Roger Patterson to be the object of Roger's film. Not only has Bob been unable to describe the actual location that the film was made, let alone how to get there, but the research of Mr. Munns has now proven once and for all that the "costume" as described by Heironimus is structurally, anatomically, and logistically incapable of portraying what is in the famous 1967 Film. We recommend you read her entire Bill Munns Presentation write-up. below are some of the photos Nadia Moore took that exposes some of the challenges Bob Heironimus would have to overcome based on how he described the construction of the suit. Bob Heironimus described the head was attached to a football helmet. A recreated head shows the angle of head tilt required. Although to be fair, Patty is leaning forward, the live person is leaning back. Dr. Jeff Meldrum has said Bill Munns dissection is the most promising and extensive reseaerch done on the film and you help the research reach more people by funding Bill Munns's documentary at IndieGoGo. The terms Bigfoot and Sasquatch are relatively modern terms, at least modern when used among most of us less indigenous folks. Before Bigfoot and Sasquatch there was the Wildman. Often described the same way as the Bigfoots we have come to know and love. The Memphis Enquirer, article dated May 9th, 1851 is a case in point. As you read the the description of hair, foot size and the amazing ability to leap up to 14ft at a time, you get a sense that this is a description familiar to most of us. 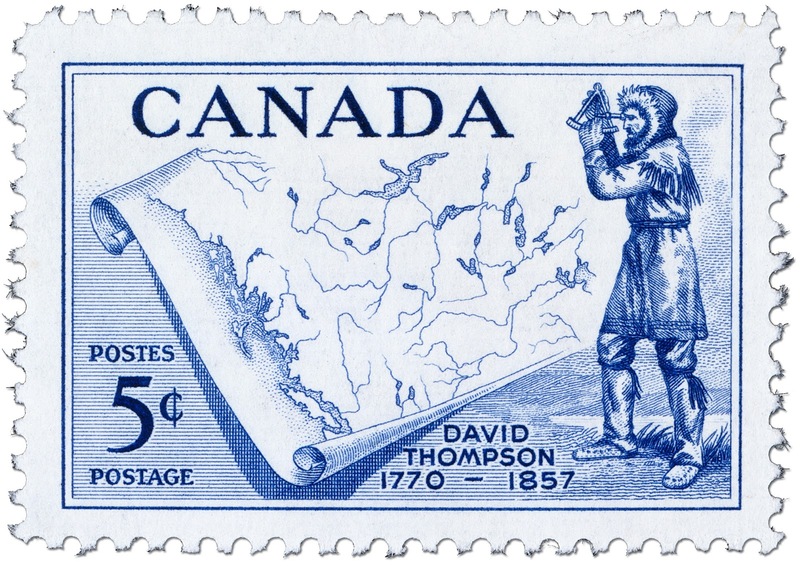 Even more interesting to us is the history the Wildman has had in the area, outdoorsmen describing encounters 17 years prior, starting as far back as 1834. "Wild Man of the Woods"
"During March last, Mr. Hamilton of Greene County, Arkansas, while out hunting with an acquaintance, observed a drove of cattle in a state of apparent alarm, evidently pursued by some dreaded enemy. Halting for the purpose, they soon discovered as the animals fled by them, that they were followed by an animal bearing the unmistakable likeness of humanity. He was of gigantic stature, the body being covered with hair and the head with long locks of hair that fairly enveloped his neck and shoulders. The "wildman," for we must so call him, after looking at them deliberately for a short time, turned and ran away with great speed, leaping from twelve to fourteen feet at a time. His foot prints measured thirteen inches each. This singular creature has long been known traditionally in St. Francis Green and Poinsett Counties. Arkansas sportsmen and hunters having described him so long as seventeen years hence. A planter, indeed, saw him very recently, but withheld his information lest he should not be credited, until the account of Mr. Hamilton and his friend placed the existence of the animal beyond cavil." Today, March 12th, in 1996, The United Paramount Network (UPN) needed a huge premier for its new TV show The Paranormal Borderline. 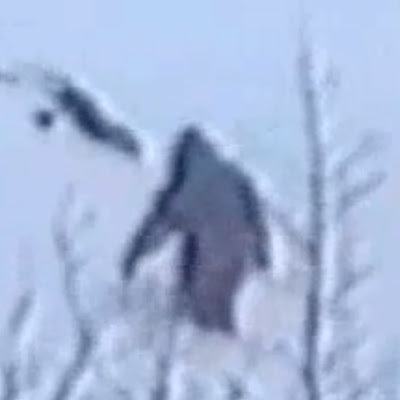 They had the perfect video, a Sasquatch regaining it's balance and walking up a snow bank. Unfortunately the segment producer for The Paranormal Borderline was also behind Alien Autopsy: (Fact or Fiction?). Both films were admitted hoaxes. You can see the footage from the TV show in the two videos below. "They traveled to Mammoth Ski resort in California and edited in stock footage of the Himalayan panoramas. I was the one who initially analyzed it. We had some suspicions qualifying our speculations, which were selectively edited out of the documentary interviews. In follow up research, the videographer came forward and admitted the prank. The producers needed a hook for the premier episode of Paranormal Borderline and hired the guy to fabricate something. It's a hoax, plain and simple." Today in Bigfoot History | JAN 11 | "Zipper" Found on Patty "Bigfoot Costume"
Today, January 11, in 1999 the color plate of frame 352 from the Patterson/Gimlin film was carefully examined by imaging specialists at a color technology laboratory in Ventura, California. State-of-the-art scanners were used to magnify the image down to the color-point level. All of this came about due to a press conference called by Cliff Cook and the supporting testimony of his associate Chris Murphy. Murphy claimed to of found a bell shape (aka zipper pull tab) within the grainy film image and even took the time to hand craft a pretzel-like, clay model of this bell shape. 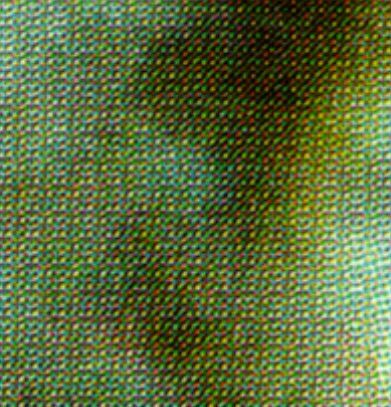 The final image in the series shows the detail in question at approximately 1600% magnification. At this level of resolution the individual points of color are clearly visible. 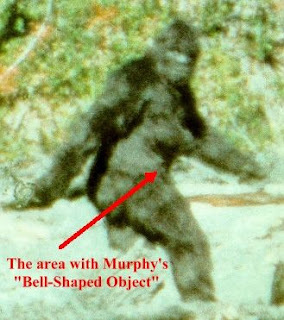 Murphy's "bell-shaped object" is not readily discernible at any level of resolution. To the naked eye the "object" appears to be a diffuse blotch of light reflecting off the fur. At increasingly higher magnification this detail still appears to be a diffuse blotch of light reflecting off the fur. Several other parts of the bigfoot figure show similar blotches of light reflecting off the fur. The detail in question has no clear edges, and has no visible "artificial" shape. The lab tests demonstrated that a clear magnification of the color plate does not reveal anything like the pretzel-like object displayed at Crook's press conference. The image analysts stated that Murphy seems to be relying on some "highly imaginative, Rorschach-like interpretations of fuzzy details in enlargements of the color plates." The Oregonian newspaper reports today that Bigfoot trackers Cliff Crook and Chris Murphy have determined that four magnified frames from the so-called ``Patterson-Gimlin Film'' show tracings of a bell-shaped fastener on the creature's waist, indicating that the image is likely that of a human being wearing a costume. 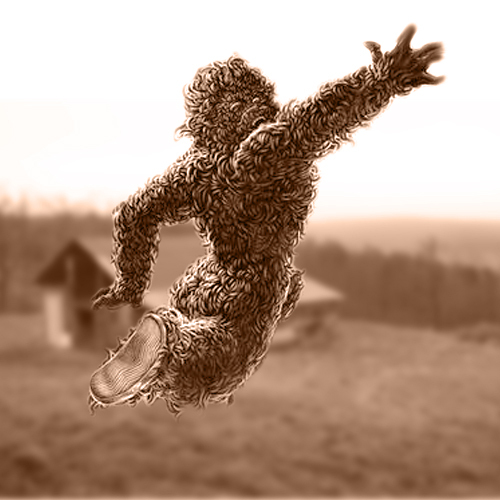 BOTHELL, Wash. (AP) - In the hearts and minds of true believers, Bigfoot's existence has long been enshrined in a single minute of jerky, grainy footage of a startled sasquatch retreating into the upper California woods. But two enthusiasts of the legendary being are alleging four magnified frames of the 16 mm footage show tracings of a bell-shaped fastener at Bigfoot's waist. 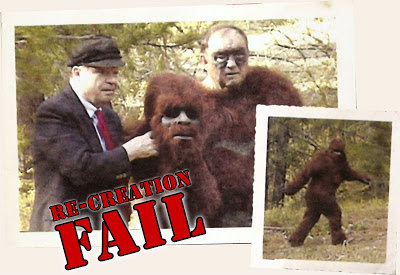 They say the creature in the so-called Patterson-Gimlin Film can finally be dismissed as a man in a monkey suit. The film, purportedly showing a female Bigfoot fleeing a stream-bed, was taken by Roger Patterson and Bob Gimlin on Oct. 20, 1967. It has largely withstood independent scrutiny and, for many steeped in the lore of the man-beast, has become bedrock evidence of its very existence. The film is important because many Bigfoot believers compare all plaster casts of telltale footprints against those made by Patterson the day he purportedly filmed the creature slinking across a sandbar in the Six Rivers National Forest. Discredit the footage, experts agree, and the gold standard for Bigfoot tracks will be washed away. Crook bases his assertion on computer enhancements performed by Chris Murphy, a Bigfoot buff from Vancouver, British Columbia, who maintains he discovered an aberration in the footage in 1995 while helping his son Daniel prepare a class project. Murphy declined to be interviewed, instead supplying a written narrative detailing his discovery. According to that account, the Murphys used a color photocopier to duplicate a frame of the Patterson film. Zooming in again and again, Chris Murphy became suspicious. To him, something geometric - vaguely the shape of a bottle opener - seemed to take shape at Bigfoot's waist. Murphy maintains that four sequential computer-scanned frames of the film show the object in different positions, as if it were swinging. He theorizes something is cinching the sasquatch costume in place. Murphy made a clay model of the object and in October gave that and the enlargements to Crook, a charter-bus driver transfixed by sasquatch stories since 1957. That's the year he made a camping trip with teen-age friends on Washington's Olympic Peninsula that ended with telltale signs of a sasquatch encounter: a rustling of brush, a throaty growl and an ever-worsening hallmark musk. Decades later, at 58, spare rooms in his home are dubbed "Bigfoot Central,'' stuffed with photos, plaster casts and maps dotted with push-pins that chart sasquatch sightings. Now his hoax assertion is giving rise to a howl that would make a Bigfoot proud. Longtime enthusiasts smell a deserter. One recent e-mail was typical of the incredulity Crook's allegation of a costume fastener is up against. Grover Krantz, a Washington State University anthropology professor and Bigfoot expert, also believes firmly in the old footage. 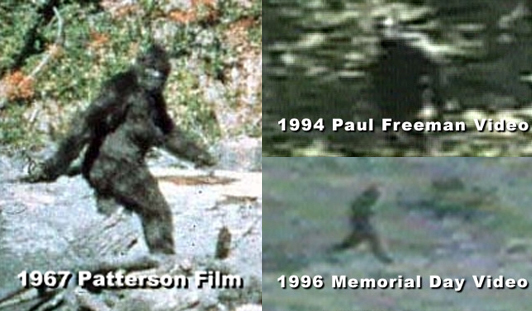 The truth of the Patterson-Gimlin film remains as elusive as Bigfoot itself. Enthusiasts such as Krantz and Crowe see the film as a building block for their faith. And the faiths of Crook and Murphy endure in spite of it. Maybe a Bigfoot will one day view the film, Crook figures, and offer its own disapproving grunt. 2003. It was a Thursday night exactly ten years ago today when a documentary film, Sasquatch: Legend Meets Science, aired on the Discovery Channel. The program featured scientists from various disciplines analyzing the most compelling evidence. 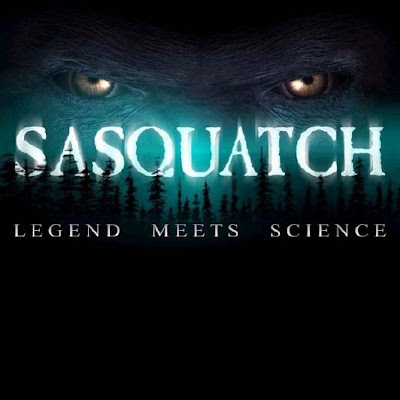 Sasquatch: Legend Meets Science was produced by Doug Hajicek with White Wolf Entertainment, the same people who brought us Monster Quest. It is narrated by the distinctive voice of Stacy Keach. 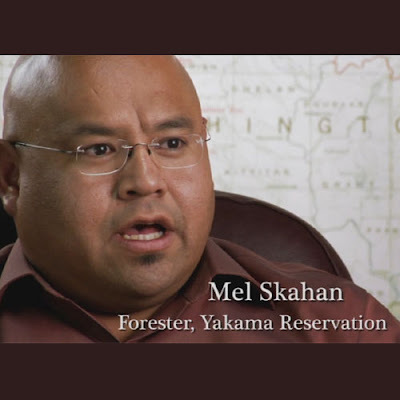 The documentary can be defined by the analyses of three pieces of Sasquatch footage and 17 categories of evidence. The three pieces of footage were the Patterson/Gimlin film, the Freeman footage and the Memorial Day footage. The 17 different categories of evidence included: fossil evidence, new species discoveries, dermal ridges, the Sasquatch body, images, step frequency, biomechanics, forensic measurements, Patterson-Gimlin film, behavior parallels, vocalizations, visual misidentification, track morphology, kinesiology, soft tissue pathology, statistics, and DNA. In the documentary, scientists from various disciplines put the most compelling sasquatch evidence to the test. Collectively their conclusions are ground-breaking. There is now scientific proof for the existence of a giant primate species in North America -- a species fitting the descriptions of sasquatches (bigfoots). The nation's top primate anatomist, Dr. Daris Swindler of Washington State Univeristy examines the Skookum Cast, along with prominent primatologist Dr. Esteban Sarmiento of the American Museum of Natural History in New York City, and anthropologist Dr. Jeff Meldrum of Idaho State University, give their conclusions about the Skookum cast, and what it points to. The nation's top bioacoustics analyst, Dr. Robert Benson at Texas A&M Corpus Christi, analyzes sound recordings of purported Sasquatch vocalizations with an advanced computerized system in his laboratory. He explains his conclusions about the recordings. Primate fingerprint expert, Officer Jimmy Chilcutt, discusses the consistent and distinct dermal ridge patterns found in track casts from the northwest and southeastern United States. He states his conclusions about the level of proof provided the dermal ridge casts evidence. DNA expert Dr. Craig Newton from BC Research in Canada attempts to extract DNA from hair samples and saliva taken from the Skookum Cast site. He explains the potential and problems with DNA analysis. Dr. Russel Ciochon shows life-size models of Gigantopithecus, and describes their interactions with early man. Various other scientists fill in other parts of the puzzle. Anthropologist Dr. Jeff Meldrum also wrote a companion book with the same title, "Sasquatch: Legend Meets Science." According to Wikipedia, the DVD version is slightly different from the broadcast including extra footage. 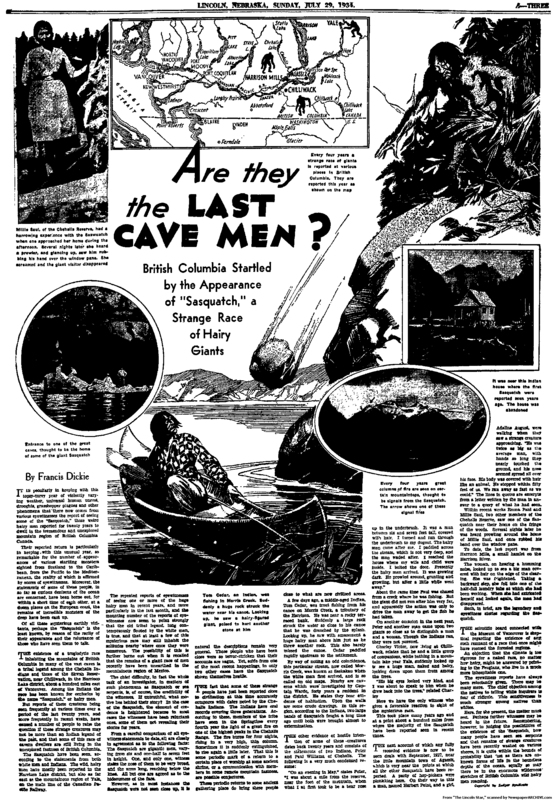 Today in 1905 The Washington Post published an article regarding the sighting of a "wildman". 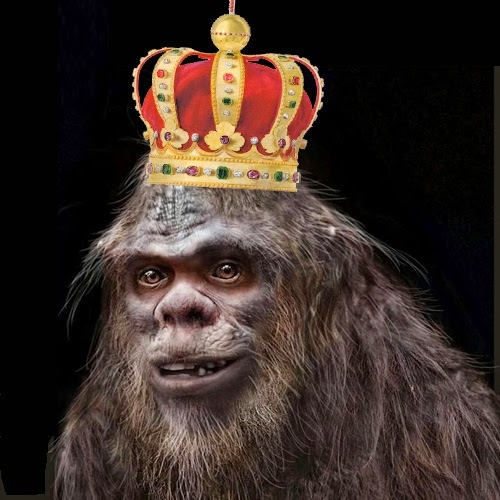 The "wildman" was described with all the Bigfoot characteristics we have become familiar with. 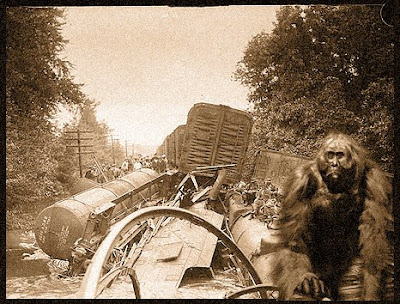 The story continues to speculate that the wild man may have escaped from a traveling circus during a train wreck. You would be surprised how often "a wild animal escaped from the circus" is used to explain a Bigfoot sighting. In the book Historical Bigfoot by Chad Arment there are at least 24 counts in as many papers suggesting circus train wrecks as the origin of the escaped "wildman". Here is a quote from the Jan 8th 1905 event. Several persons give it as their opinion that this creature is a wild animal of some kind that made its escape from the Robinson & Franklin circus that was touring this peninsula a number of years ago. The circus train met with a railroad wreck, and several wild animals were freed from their cages, many of these beasts were captured, and others were shot, and while others were never seen by the circus people again. The source of all of this can be read online at Google books. 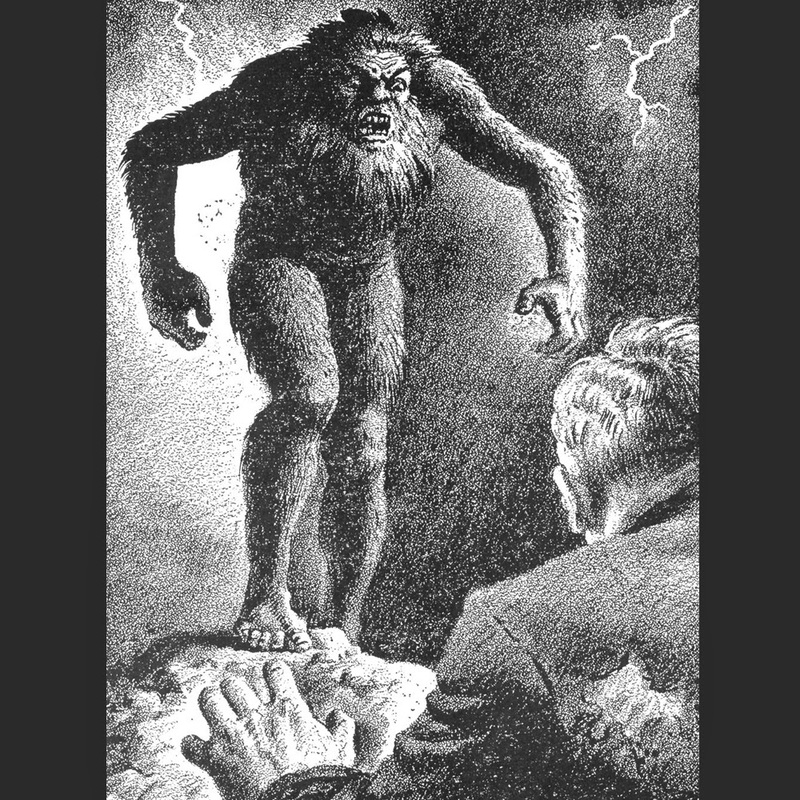 The Historical Bigfoot, by Chad Arment, which covers sightings of Wild Men, Gorillas, Yahoos, and What-Is-It's, from the early 1800s to the 1940s. Before the term "Bigfoot" was coined to signify an unknown species of North American primate, sightings of towering bipedal apes were reported throughout the continent, and were called by a variety of names. This book compiles and sorts the most significant sightings, but also provides a look at hoaxes, mis-identifications, and the influential perspective of newspaper editors as they dealt with reports of a strange hairy manlike ape. I now recur to what I have already noticed in the early part of last winter, when proceeding up the Athabasca River to cross the mountains, in company with.... Men and four hunters, on one of the channels of the River we came to the track of a large animal, which measured fourteen inches in length by eight inches in breadth by a tape line. As snow was about six inches in depth the track was well defined, and we could see it for a full hundred yards from us, this animal was proceeding from north to south. We did not attempt to follow it, we had not time for it, and the Hunters, eager as they are to follow and shoot every animal, made no attempt to follow this beast, for what could the balls of our fowling guns do against such an animal? Report from old times had made the head branches of this River, and the Mountains in the vicinity the abode of one, or more, very large animals, to which I never appeared to give credence; for these reports appeared to arise from that fondness for the marvelous so common to mankind: but the sight of the track of that large a beast staggered me, and I often thought of it, yet never could bring myself to believe such an animal existed, but thought it might be the track of some Monster Bear. For all you rational, critical thinkers who took Santa Claus away from us at 6yrs old. Yes, we know snow melt distorts prints and we don't know how long the tracks were laid before they were discovered. We are also aware that 8 inches is rather wide for a 14 inch print. Prints 8 inches wide are usually at least 17-18 inches in length. So even with the obligatory caveats listed in the previous sentences, we still love adopting David Thompson's mystery creature into the Bigfoot lore. After all, we are the same blog that thinks historically, werewolves are potentially misidentified Bigfoots. Today in 1997 according to the book, Bigfoot Exposed, Dr. Jeff Meldrum stakes much of his academic reputation on the Paul Freeman trackway. This trackway was a series of Bigfoot tracks from the Blue Mountains near Walla Walla, Washington. He wrote his support on a posting to the Internet Virtual Bigfoot Conference, an online (email-based) Bigfoot research community. This was a pretty big deal since at the time Dr. Jeff Meldrum was member of the Biological Sciences faculty at Idaho State University and Grover Krantz’s professional heir-apparent in the field of anthropology. 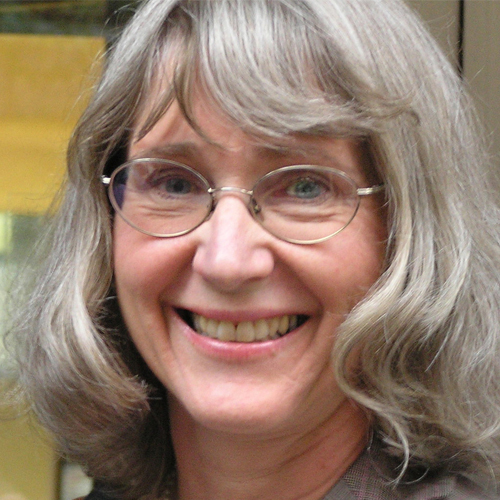 Currently as of 2013, Meldrum is a full professor. 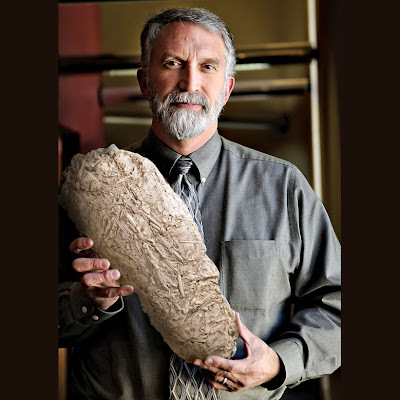 Krantz was the first university professor to publicly support and research the possibility of Bigfoot's existence. The point is, Dr. Meldrum found enough interesting about the trackway himself, that he was compelled independently what he had observed himself. But let’s back up and discuss Paul Freeman a bit. Paul freeman is described in an AP article. Freeman, 45, does not seem the type to spook easily. He is beefy, bearded and, at 6-foot-4 and 265 pounds, approaches Sasquatch proportions himself. He's a meat-cutter by trade; an outdoorsman and hunter by nature. Apparently he put down the butchers knife and started to search for bigfoot. Before his death he had claimed to see Bigfoot himself 4 times and has collected more cast, most of them with dermal ridges, more than any other Bigfoot hunter. This brings us back to Meldrum. Meldrum not only staked his good name but also put his money where his mouth is, he ended up buying Freeman’s collection for a sum of nearly $2000 dollars. Dr. Meldrum was quoted by the Walla Walla Union-Bulletin, "I’d been given an earful by people about Paul’s reputation, and it was bad. I went into it very skeptical." You can read Meldrum's initial reaction to the prints at our post, Dr. Jeff Meldrum Compelled by Freeman Tracks. You can get further details at Cliff Barackman's Cast Database.